Join us for a week in the beautiful mountains of Portugal. 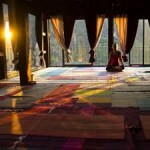 Birgitte will teach a yoga retreat supporting a somatic self-inquiry on your mat with slow, deep posture flows, sensitive and natural breath release and sweet bedtime meditations. The yoga posture practice is based on continuous movements that gradually deepen your sensitivity to sensation and invite you to listen to the teacher within. Morning classes begin with a seated pranayama practice and transitions into a soft vinyasa flow teaching balanced muscular activity to support your joints while strengthening and mobilizing the whole of your body. Afternoons offer a more quiet and meditative flow releasing connective tissue and nervous system. Two evenings we will play with the Big Mind process inviting you to collectively reflect and work with what comes up in your practice during the retreat. Big Mind was developed by Zen Master Genpo Roshi and takes place as a dialogue between the facilitator and the group. The Big Mind work allows you to tap into the wisdom within by giving voice to undiscovered aspects of the self. 3 Afternoon classes clarifying techniques and releasing the body.